It’s 1957 and as American children learn to Duck And Cover in the classroom, the Cold War stalemate between the West and the Soviets threatens to heat up at any moment, both sides poised with their fingers on the atomic button as on the streets faceless, invisible men, spies, play the Great Game in the wilderness of mirrors. When alleged Soviet spy Rudolf Abel (Mark Rylance) is nabbed by the CIA, justice must not just be done but be seen to be done and, before the government can hang him, he’s got to have a fair trial, insurance lawyer James Donovan (Tom Hanks) drafted in pro bono to represent the spy. But Donavan is a true-blue American boy scout who considers it his patriotic duty, as an American (salutes flag with tear in eye and hand on heart, yes sir!) to give his client the best defence possible, even if it turns him into a pariah. Cue epic courtroom battle, Hanks channelling Capra-era Jimmy Stewart and Gregory Peck’s Atticus Finch as he argues for Abel’s life as well as Truth! Justice! and The American Way! before the Supreme Court. Meanwhile, hot shot pilot Francis Gary Powers (Austin Stowell) is captured by the Reds and subjected to a show trial when his U2 spy plane is shot down over the Soviet Union. With the lives of Powers and Abel hanging in the balance and the world on the brink of nuclear war, the expendable Donovan is dispatched to a divided Berlin as the Wall goes up in order to negotiate a prisoner exchange with the Russians to take place on Berlin’s frozen Glienicke Bridge, the no man’s land where East meets West, the Bridge of Spies. 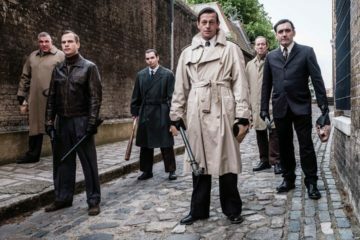 Straining fact and fiction through a Mark Charman script that’s obviously been sharpened by the Coen Brothers, Bridge Of Spies is a curiously uninvolving piece despite fine work from Hanks and Rylance whose scenes together sing of the film that might have been (Rylance particularly good as the quietly heroic, stoic spy), Spielberg’s direction unsubtle and ponderous, only really coming to life when he gets to stage Powers’ white-knuckle plane crash. Alex Cox once accused Spielberg of being a confectioner rather than a filmmaker and, when the boy gets to play with his toys, he’s a master chocolatier Lindt would be proud of, Powers desperate attempts to destroy the evidence of his spying as he plummets to earth, tense and exciting. Elsewhere however, you get the impression that Spielberg is a little lost in his material, unsure what kind of film he’s making, which story he’s telling, possibly bored of all those Mad Men-aestheticised scenes where middle aged men talk at each other in offices in the middle of the day while smoking cigarettes and quaffing Scotch from chunky tumblers. Both Donovan’s defence of Abel and the prisoner exchange a few years later contain enough material to make fascinating films in their own right, Spielberg instead deciding to do justice to neither, rattling through the courtroom drama in order to get to get to the tension-free spy game which every reviewer who’s never bothered to read le Carre is anointing le Carre-esque, Spielberg showing the same keen political nous he showed in Indiana Jones And The Kingdom Of The Crystal Skull, substituting le Carre’s cynical, bruised romanticism, increasingly caustic politics and deep suspicion of empire (be it British, American or Russian) for sophomoric, overly sentimental, stirring inspiration where Tom Hanks’ fast-talking insurance shyster literally is America. A mouthpiece for whichever argument he can win whether that’s dancing rings around insurance claimants who expect to be compensated for injuies caused by one of his clients, representing Commie spies or negotiating with a foreign power, Hanks is that most American of 20th century American heroes; a rich, white, middle class lawyer who can also afford to be an idealist. It’s a vision of Donovan that’s somewhat at odds with the reality of a man who was a prosecutor at Nuremberg, who had seen the depths of depravity and evil that man can sink to, yet Spielberg expects the audience to believe such a man would be shocked by witnessing East German border guards shooting unarmed defectors in the back in a scene heavy-handedly referenced later in the movie. 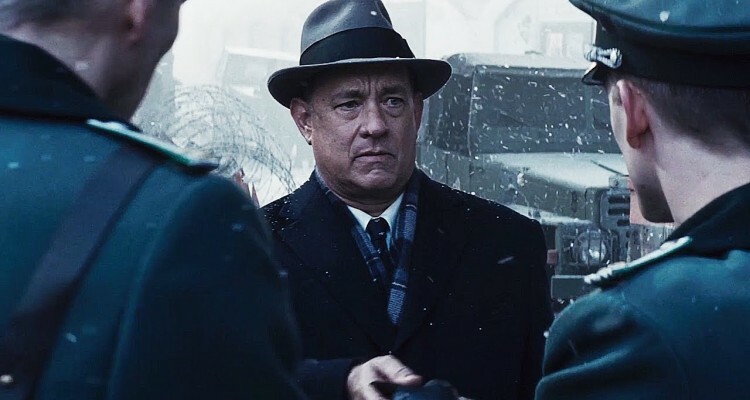 Handsome and watchable without every inspiring a human emotion, Bridge Of Spies is a forgettable history lesson of a largely forgotten event. As Spielberg’s Cold War thrillers go however, at least Tom Hanks never tries to surf a nuclear blast wave in an abandoned fridge.